One of the main features of Linksys Smart Wi-Fi Routers (E4200 v2, EA2700, EA3500, EA4500, EA6100, EA6200, EA6300, EA6350, EA6400, EA6500, EA6700, EA6900, EA8500, EA9200, WRT1200AC, and WRT1900AC) is the option to forgo or opt out in signing up for a Linksys Smart Wi-Fi Account but still have full access to your router and network settings. Using the local access of your router is a faster and convenient way to access your router without logging in to your Linksys Smart Wi-Fi Account. However, since your router and network settings are not configured on your Linksys Smart Wi-Fi Account, you will not be able to use the remote management feature to check your router or network activity when you’re away from home. This article will guide you on how to switch to the local access interface. 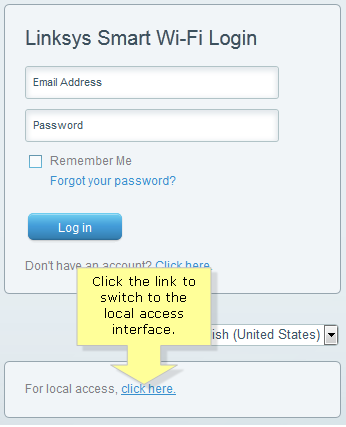 Open a web browser and enter https://linksyssmartwifi.com/ on your address bar to go to the Linksys Smart Wi-Fi page. 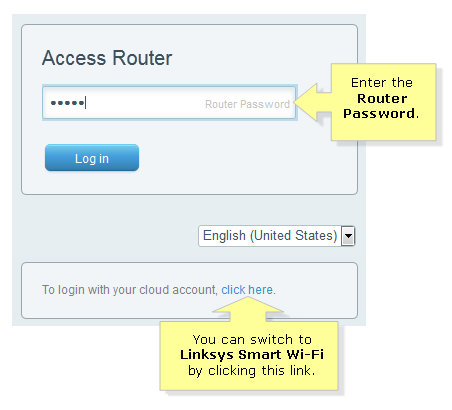 On the login page, select the click here link below the Linksys Smart Wi-Fi Login. NOTE: You will be able to access the local access interface only if the computer or device you are using is connected to the router wired or wirelessly. Enter the Router Password on the given field. QUICK TIP: If you would like to switch back to logging in with your Linksys Smart Wi-Fi Account, select the click here link below the Access Router fields. NOTE: The default Router Password of your Linksys Smart Wi-Fi Router is admin. Once you’re logged in, you will be able to configure your router and network settings as usual. NOTE: Device List is displayed as Network Map Tool among Linksys EA8500, EA9200, WRT1200AC, WRT1900AC, and WRT1900AC v2. External Storage is displayed as USB Storage among older firmware versions of Linksys Smart Wi-Fi Routers. QUICK TIP: The banner at the top part of the screen is a light blue color to denote that you are accessing the local interface. A dark blue banner denotes you are logged in using your Linksys Smart Wi-Fi Account.